Hello friends! I hope you all had a lovely weekend! I’m going to squeeze one more soup recipe onto the blog before it starts getting too warm and no one wants to eat soup anymore. I hear the East Coast got a huge snowstorm last week, so this is perfect soup to warm your soul while you wait for the snows to melt. 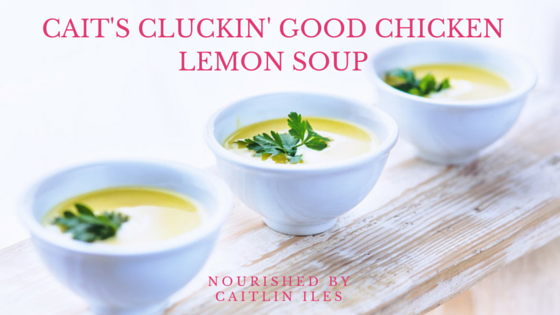 I am a huge fan of lemons and this soup is one of my all time faves… I know it seems I say that a lot, but seriously I still remember the first time I ever had Chicken Lemon Rice soup and it was love at first bite. Turns out with just a few tweaks, such as replacing the vegetable oils and using fresh ingredients, this soup is incredibly healthy in addition to being delicious. The following is a recipe I’ve been playing with over the last few months. Lets get to it shall we! This tangy citrus fruit is an excellent source of vitamin C, which is a necessary component of the antioxidant glutathione. This master antioxidant helps neutralize toxins and free radicals in the body and people who are deficient in this crucial molecule can suffer from the following imbalances, to name but a few! That being said, lemons are a great addition to the diet not only because of their vitamin C content, but because they help support the production of liver enzymes thereby supporting our liver function. Regulate inflammation in the body thanks to its EFA content. In order for the eggs to have the best EFA profile possible, they must come from hens fed an evolutionarily sound diet—meaning they get an omnivorous diet full of bugs, insects, and plant matter. Chickens are not vegetarians. Gelatin: this nutrient comes from the breakdown of collagen in bone marrow, cartilage, tendons, and ligaments and is great for healing the digestive tract. Minerals: calcium, magnesium, phosphorous, and potassium. Bonus these minerals are super easy to absorb, so each bowl of bone broth is like taking a multi-mineral supplement! Glycine and proline: amino acids that are not commonly found in abundance in muscle meats and which help with digestion, immunity, muscle growth and repair, and balancing the nervous system. Sounds pretty good, huh? And this list doesn’t even include all the sweet benefits you’ll be getting from the veggies in this bad boy. So first things first, I would suggest cooking the rice separately and adding it to each individual portion otherwise it gets super squishy and porridge-like, which I love but some people who don’t have my affinity for squishy food might not enjoy so much. Now the piéce de resistance! 1.5 L chicken stock—homemade if possible! As it heats, cut chicken into bite-sized cubes and add to oil. You may also use pre-cooked chicken or turkey. If so, skip to step 5. Add thyme, rosemary, sage, and poultry seasoning and mix into chicken. Heat chicken until almost fully cooked, then remove and set aside in a small bowl, leaving the oils and juices in the pot. Add onions and cover until browned, stirring occasionally. If you are using pre-cooked chicken, add thyme, rosemary, sage, and poultry seasoning here. Once onions are browned add garlic. 1 minute later add shredded carrots and celery. 3 minutes later add chicken back to pot and stir. Cover everything with stock, adding a couple extra inches over the veggies and chicken. Add bay leaves and let simmer 15-20 minutes, until all veggies are soft. Add lemon juice and zest. At this point if you want a smoother soup you can remove bay leaves then puree and return to heat. I do both depending on whether I want it chunky or not. Separate egg yolks into a bowl; remove ½ cup soup from the pot and whisk into the egg yolks. Save whites to make soufflés, meringues, or to use in this pancake recipe. Add egg yolk mixture to the soup, stir, cover, and let simmer 5 minutes. Taste and add salt and honey. Serve over rice. Garnish with celery leaves for an extra delicious tang! So there it is friends, a delicious tangy, home-style soup like your mama used to make! It should be the perfect companion through these last couple of weeks of winter. Have a wonderfully whimsical week everyone!